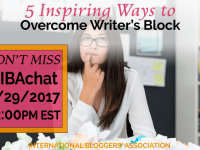 In this week’s #IBAChat, we’ll discuss 5 tips to increase productivity with intentional blogging. Learn how reconnecting with your blog’s purpose can help increase efficiencies and lower stress levels. Help other bloggers be more intentional by pinning this pin! Have you ever found yourself immersed in the daily tasks of blogging only to become frustrated, overwhelmed, and questioning your purpose? Sometimes the overall intention of our blog becomes buried under the heavy load of all the responsibilities associated with blogging. That’s where reconnecting with your original blogging purpose comes in. Utilizing the strategy of intentional blogging can greatly increase your productivity and lower stress levels. And who doesn’t want less stress?! This week, we welcome IBA Board Member and productivity expert, Debbie Rodrigues. So join us, this Wednesday, April 5 at 12 Noon EDT on Twitter to learn her 5 tips to increase productivity through the practice of intentional blogging. Don’t forget to also bring your favorite post of the week for our opening blog-share. The #IBAChat takes place every Wed at 12:00 PM EST on Twitter! We know you are crazy busy, but we didn’t want you to miss another #IBAchat! Every week we will send a quick reminder email for you. 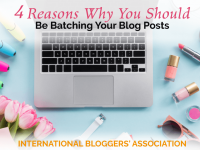 Sign Up For YOUR #IBAchat Reminder Email! Your email will include this week’s topic and with time. And, don’t worry you can unsubscribe anytime! This week we will be joined by special Guest Host Debbie Rodrigues! Debbie is a Productivity Expert who helps successful women regain control of their schedule to develop a fulfilling lifestyle. She blogs at www.DebbieInShape.com.